Wireless charging is one of the greatest things to have happened to smartphones in the past five years. Seriously, I can’t even imagine going back to a world where I have to mess with cables and connectors every time I need to charge my phone. But why should you have the convenience of wireless charging in your home or office only to have to go back to corded charging in your car like a caveman? Guess what: you don’t. 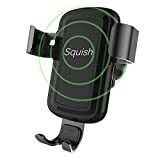 Pick up a Squish Wireless Charging Universal Car Mount on Amazon while it’s on sale at a discount, even though it’s still totally worth it even at full price. Trust us, it’s going to change your life. 2 IN 1: Wireless charger and car phone mount are combined as one. Power your device on the road without the need of messy cables inside your vehicle, we combined the most convenient method of mounting your phone with the most convenient method of charging your phone. Its quick mount technology allows for a safe and secure quick phone mounting together with a 360-degree rotating cradle that provides flexible viewing making this wireless charger the real deal. QUALITY MATERIAL: Anti-scratch & anti-slip rubber material base padding for a secure and safe grip, allowing for a worry free travel. Go over humps or a dirt trail and your phone will remain in place while charging. Built-in wireless charging chip-set. Qi Standard Approved. APPLICATIONS: You can securely install this phone holder on almost any vehicles air vents with a hassle-free mounting that is managed in seconds, with absolutely no tools required. Not only can you use this inside your vehicle, but also in your office, your room, your study or pretty much anywhere. You have endless possibilities. (To achieve best performance of this wireless charger, QC2.0/QC3.0 car charger is suggested to be adapter). COMPATIBILITY: Works with most smart phones, regardless of size or shape. Wireless charging for Qi-enabled and Quick Charging devices only. Suitable for most phone cases such as full cover, silicone/rubber, hybrid, plastic, and many more varied types of phone cases. Phone holder can fit most smart phones cases (Thickness < 0.29 in).But UAG and Otter cases are not included.